You, as a professional cosmetologist, you know how much disease there is in our world and how important it is to protect customers from them. Almost all subjects working in cosmetology and medicine reusable and are used more than one year - tweezers, clamps, scissors, nippers .... And for complete sterilization of reusable instruments we recommend to use only professional equipment, one of them is represented by container sterilization. 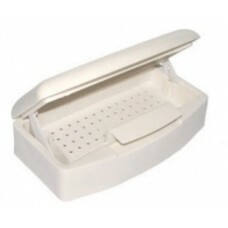 It is quite roomy and so is suitable for your working cosmetics or suitcase. Container for sterilization and relevant for the medical practices of various directions (therapeutic profession, dentistry, gynecology ...).